Dryers stop working right when one of their parts is damaged or the appliance is clogged. What’s wrong with your dryer? Call us and let us find out. We are experts in all models and provide dryer repair in Cranford. You can trust the knowledge and experience of our techs. We will fix your dryer irrespective of its brand and cover emergency needs with same day service. Contact Appliance Repair Cranford NJ to fix dryer problems but also for maintenance. We are here to replace parts but also to install new electric and gas dryers. Why trust dryer repair to our company? 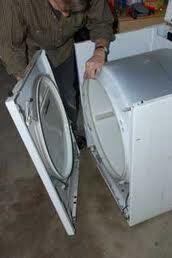 We provide dryer repair service in Cranford, New Jersey. Our company covers emergency needs with same day services. Our techs are knowledgeable laundry appliance technicians and have long experience. All service vans contain superb diagnostic equipment, spares, and tools. Our pros service most brands and models. Our service includes the installation and maintenance of dryers too. We offer upfront pricing and have reasonable rates. We offer washer and dryer repair in case you own a combo appliance. From dryer installation to repairs, all services are vital for the good performance and safe operation of the appliance. That’s why we do it all. You can call us to install new dryers – whether you choose gas or electric appliances. We also install combos. Each time, our techs pay great attention and make sure all connections are done right. We can help you avoid problems by offering regular dryer service. With preventive maintenance, the dryer is free of lint and thus it won’t get clogged. Our pros inspect all dryer parts and will fix them up to ensure good operation. No matter what the issue is, our techs will find its cause and fix it in no time flat. Trust us to service your dryer promptly and efficiently. Call us today to take good care of your laundry appliance.